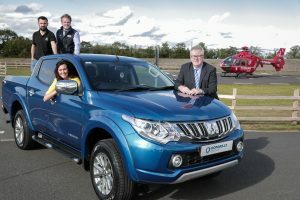 Northern Ireland’s largest family-owned new and used vehicle retailer, the Donnelly Group, has announced it will host a province-wide pickup event in aid of Air Ambulance Northern Ireland and in partnership with the Young Farmers Clubs of Ulster. Taking place on Saturday 20th October (2pm-6pm) at Speers Farm, Keady Road, Armagh, anyone with a Pick Up and a valid driving licence can buy tickets online now. A registration fee of £20 per vehicle is required, with all proceeds going towards the Air Ambulance Northern Ireland. “This is a really exciting event, and we’re delighted to have the support of the Young Farmers Clubs of Ulster as well as Grassmen. “At Donnelly Group, we are always looking for ways in which we can give something back to our community. We are extremely proud that through this event, we can help support Air Ambulance Northern Ireland and the amazing life-saving service the team provides. “On the day, our Pick Up Round Up judging panel will be taking various factors into consideration and there will be prizes for vehicles with the Highest Mileage, the Dirtiest and the Cleanest, and the Most Accessories, amongst others. Entrants could be in with the chance of winning a Kernan Aviation Flying Experience, a Karcher Power Washer worth £500 or a £300 pre-paid fuel card. Donnelly Group is a leading seller of pickups from a variety of manufacturers including Mitsubishi, Toyota, Volkswagen and Fiat. “Since its introduction in July 2017, the Ambulance has flown more than 450 missions and requires £2million each year to maintain the vital services. “Our EC135 helicopter can get anywhere in the province in approximately twenty-five to thirty minutes and the rapid response is vital in an emergency situation. We rely entirely on support from the public and local businesses, including Gifts in Wills which is why all support is so greatly appreciated. “Young Farmers Clubs of Ulster is really glad to be on board with the Donnelly Group for what will be an unforgettable occasion.